"Morrill Act" redirects here. For the act regarding polygamy, see Morrill Anti-Bigamy Act. The Morrill Land-Grant Acts are United States statutes that allowed for the creation of land-grant colleges in U.S. states using the proceeds of federal land sales. The Morrill Act of 1862 (7 U.S.C. § 301 et seq.) was enacted during the American Civil War and the Morrill Act of 1890 (the Agricultural College Act of 1890 (26 Stat. 417, 7 U.S.C. § 321 et seq.)) expanded this model. An Act donating Public Lands to the several States and Territories which may provide Colleges for the Benefit of Agriculture and the Mechanic Arts. 7 U.S.C. ch. 13 § 301 et seq. For 20 years prior to the first introduction of the bill in 1857, there was a political movement calling for the creation of agriculture colleges. The movement was led by Professor Jonathan Baldwin Turner of Illinois College. For example, the Michigan Constitution of 1850 called for the creation of an "agricultural school", though it was not until February 12, 1855, that Michigan Governor Kinsley S. Bingham signed a bill establishing the United States' first agriculture college, the Agricultural College of the State of Michigan, known today as Michigan State University, which served as a model for the Morrill Act. On February 8, 1853, the Illinois Legislature adopted a resolution, drafted by Turner, calling for the Illinois congressional delegation to work to enact a land-grant bill to fund a system of industrial colleges, one in each state. Senator Lyman Trumbull of Illinois believed it was advisable that the bill should be introduced by an eastern congressman, and two months later Representative Justin Smith Morrill of Vermont introduced his bill. Unlike the Turner Plan, which provided an equal grant to each state, the Morrill bill allocated land based on the number of senators and representatives each state had in Congress. This was more advantageous to the more populous eastern states. The Morrill Act was first proposed in 1857, and was passed by Congress in 1859, but it was vetoed by President James Buchanan. 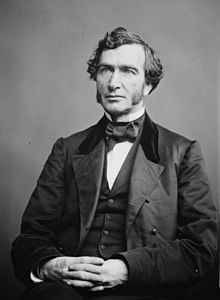 In 1861, Morrill resubmitted the act with the amendment that the proposed institutions would teach military tactics as well as engineering and agriculture. Aided by the secession of many states that did not support the plans, this reconfigured Morrill Act was signed into law by President Abraham Lincoln on July 2, 1862. The previous day Lincoln signed a bill financing the transcontinental railroad with land grants. Less than two months earlier he signed the Homestead Act encouraging western settlement. Together these actions, taken at a time when the Union Army was poorly performing, did much to define post–Civil War America. Morrill Hall, on the campus of the University of Maryland, College Park (a land-grant university), is named for Senator Justin Morrill, in honor of the act he sponsored. 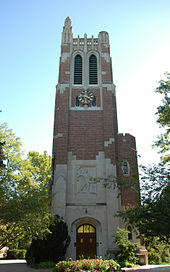 Beaumont Tower at Michigan State University marks the site of College Hall which is the first building in the United States to teach agricultural science. Under the act, each eligible state received a total of 30,000 acres (120 km2) of federal land, either within or contiguous to its boundaries, for each member of congress the state had as of the census of 1860. This land, or the proceeds from its sale, was to be used toward establishing and funding the educational institutions described above. Under provision six of the Act, "No State while in a condition of rebellion or insurrection against the government of the United States shall be entitled to the benefit of this act," in reference to the recent secession of several Southern states and the contemporaneously raging American Civil War. On September 12, 1862, the state of Iowa was the first to accept the terms of the Morrill Act which provided the funding boost needed for the fledgling State Agricultural College and Model Farm (eventually renamed Iowa State University of Science and Technology). The first land-grant institution actually created under the Act was Kansas State University, which was established on February 16, 1863, and opened on September 2, 1863. Before the Civil War, American engineers were mostly educated at West Point. While the Congressional debate associated with the Morrill Act was largely focused on benefits to agriculture, the mechanic arts were specifically included. After the Civil War, as the German University model began to replace the English College, with the encouragement of the Morrill Act, the engineering discipline was gradually defined. Because the Morrill Act excluded spending on buildings, engineering specific infrastructure such as textbooks and laboratories were developed. [clarify] In 1866, there were around 300 American men with engineering degrees[clarify] and six reputable colleges granting them. By 1911 the United States was graduating 3000 engineers a year, and had a total of 38,000 degreed engineers. The Morrill Act coincided with the establishment of engineering in the American university. To maintain their status as land-grant colleges, a number of programs are required to be maintained by the college. These include programs in agriculture and engineering, as well as a Reserve Officers' Training Corps program. A second Morrill Act in 1890 was also aimed at the former Confederate states. This act required each state to show that race was not an admissions criterion, or else to designate a separate land-grant institution for persons of color. Among the seventy colleges and universities which eventually evolved from the Morrill Acts are several of today's historically Black colleges and universities. Though the 1890 Act granted cash instead of land, it granted colleges under that act the same legal standing as the 1862 Act colleges; hence the term "land-grant college" properly applies to both groups. Later on, other colleges such as the University of the District of Columbia and the "1994 land-grant colleges" for Native Americans were also awarded cash by Congress in lieu of land to achieve "land-grant" status. In imitation of the land-grant colleges' focus on agricultural and mechanical research, Congress later established programs of sea grant colleges (aquatic research, in 1966), urban grant colleges (urban research, in 1985), space grant colleges (space research, in 1988), and sun grant colleges (sustainable energy research, in 2003). Starting in 1887, Congress also funded agricultural experiment stations and various categories of agricultural and veterinary research "under direction of" the land-grant universities. Congress later recognized the need to disseminate the knowledge gained at the land-grant colleges to farmers and homemakers. 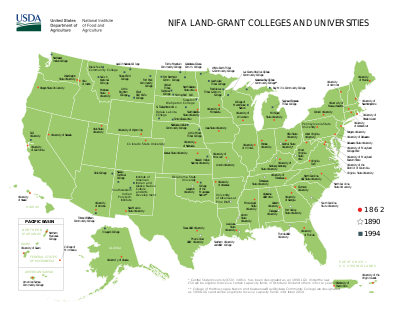 The Smith–Lever Act of 1914 started federal funding of cooperative extension, with the land-grant universities' agents being sent to virtually every county of every state. In some states, the annual federal appropriations to the land-grant college under these laws exceed the current income from the original land grants. In the fiscal year 2006 USDA budget, $1.033 billion went to research and cooperative extension activities nationwide. For this purpose, then President George W. Bush proposed a $1.035 billion appropriation for fiscal year 2008. ^ "Milestones of MSU's Sesquicentennial Archived 2007-08-06 at the Wayback Machine". MSU University Archives and Historical Collection. Retrieved March 5, 2008. ^ Letter from Lyman Trumbull to J.B. Turner, 1857-10-19. ^ Carl L. Becker, Cornell University Founders and The Founding (Cornell University Press 1943), pp. 28–30. ^ The Morrill Act used the phrase "military tactic". ^ a b c "A Land-Grant University" (PDF). Cornell.edu. Archived from the original (PDF) on February 28, 2008. Retrieved 2013-02-12. ^ "History of Iowa State: Time Line, 1858–1874". Iowa State University. 2006. Archived from the original on 13 May 2009. Retrieved 9 July 2009. ^ "CSREES FY2008 President's Budget Proposal" (PDF). Retrieved 2013-02-12. Wikimedia Commons has media related to Morrill Act. "Text and PDF of original 1862 manuscript of Morrill Act". OurDocuments.gov. U.S. National Archives and Records Administration. An Audacious Act: How a High School Dropout Helped Educate America. Amherst, MA: New England Public Radio. September 21, 2013. Archived from the original on November 1, 2013. Retrieved December 10, 2013. A radio documentary on the Morrill Land-Grant Acts.